Test your Italian writing skills! 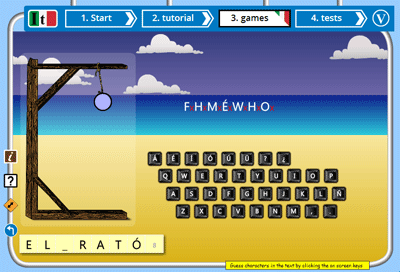 In our Hangman for Italian learners the computer chooses a piece of Italian vocabulary from the selected topic and you attempt to guess it by clicking letters on a keyboard. The game is set on a beach, and wrong guesses darken the sky and sea and more clouds sweep across until...well, try it and see what happens! Select "Hangman" from the Italian games page. The scene is a beach - there is a Italian keyboard and empty numbered boxes for a Italian word or phrase. Continue guessing until you complete the Italian vocabulary or your character is hung.